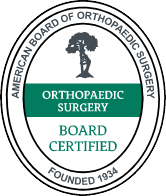 All OrthoConnecticut physicians are board certified orthopedic surgeons who are trained to take care of non-operative orthopedic issues for the entire musculoskeletal system. Most, if not all, providers practice “General Orthopedics” and evaluate back, shoulder, knee, hip, foot and ankle conditions for both adults and children. Also, most if not all, orthopedic surgeons are trained to surgically treat multiple areas of the body both for emergency and elective surgery. Many of our surgeons take trauma call at Danbury, New Milford and Norwalk Hospitals and take care of fractures throughout the body with and without surgery. In addition, many of our surgeons have special areas of interest with many completing fellowship training in very specific disciplines. Please feel free to consult with your physician on their background, experience and training in the area of concern.